Where on (Google)Earth? #97 – 1st Anniversary! Well, well, well … one year ago today (January 18th, 2007), the first Where on (Google)Earth was posted (I think I still owe Thermochronic a t-shirt). Wow, almost 100 installments in one year! I’m really happy that this game has been so successful. A lot of credit goes to Ron for first suggesting that we make a series in which the winner hosts the next one. That format has certainly contributed to making the geoblogosphere more connected. In case you haven’t played in a while, it has expanded even more in recent weeks as a result of establishing more connectivity in the geoblogosphere. There is now a blog site devoted to WoGE called A Thin Section. Essentially, those who win but don’t have a blog can suggest a location to A Thin Section and it’ll be posted there. Additionally, the site will provide a link to where the current WoGE is being hosted (in case you can’t find it). Thanks to everybody for playing! I hope we can continue having fun with this game. Without any further ado, here is Where on (Google)Earth #97. Just for birthday fun, there is no Schott Rule for this one! I often think that the locations I choose will be difficult and then they end up being easy for somebody. If this one sits around for a couple days without any action, I’ll provide a clue. I’ll be updating the winners list this afternoon after my classes are done. I’ll also wait a while on trying to answer this one so that folks have a chance to work a WoGE in its natural habitat. North and east of La Paz, Bolivia. About 12 km NE of Puerto Salinas. Nice river meanders… Otherwise, I know nothing of the local geology. Congratulations! I was looking at every river in Peru and Brasil but it never occured to me to also check out Bolivia. 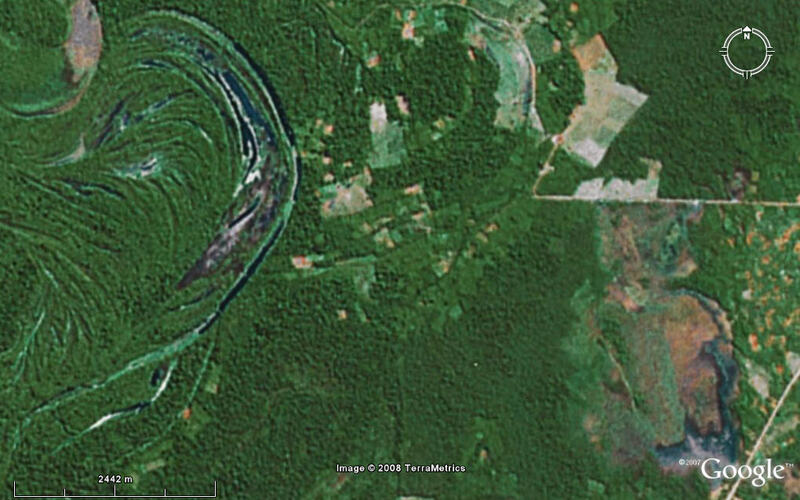 Are we looking at an oxbow lake and evidence of deforestation and wild fires? I know nothing about the geology … I looked up the town “Reyes” because WoGE#1 was Point Reyes, and my search came up with Reyes, Bolivia, which is a tiny, tiny town just to the east of the image. Good find…I thought it was gonna be a hard one! Anyway, I have a suggestion for the next one. Do I send it to you or to A Thin Section? With the recent spate of winners without blogs, folks who go only by initials, and new blogs being created to host Where on (Google) Earth challenges, it’s gotten a little confusing for me to follow who’s who. I’m particularly concerned about A Thin Section posting other’s folks wins along with original WoGE posts of his(?) own. I’d really prefer if we kept the master list in a single place on either a static web page (periodically updated) or in my KMZ file above. I’m also a little disturbed that original posts on A Thin Section are being modified after they’re solved, so it’s impossible to see the original challenge (useful from an archival perspective). I’m really glad to see the renewed vigor in WoGE and all the new participants, but I’m concerned we’re losing some of the traditions that have kept this series going strong for the past year. I welcome anyone’s suggestions and input. Just to add a further elaboration on my last comment. Although on the one hand I see the value of having a centralized clearinghouse for WoGE challenges (what I think A Thin Section is trying to do), I think it defeats one of the positive by-products of the way things have developed over the last year. Up until recently, it was necessary to track through the comments of old WoGE posts to follow the chain up to the current WoGE post. While somewhat inefficient (compared to a central clearinghouse approach) it has the added benefit of making folks visit the host blogs and follow the comments more frequently, which I believe has real benefits for building conversations and a sense of community. This is actually one of the things that I value a lot from the experience over the past year and I’d hate to see it diluted. Anyhow, that’s my two cents – take it for what it’s worth. D’oh. The comment referred to in my previous comment is stuck in the moderation queue. The above comment will make more sense once the one preceeding it is available. I think if A Thin Section would be serving like a central archive it might be a good compromise. That way we still can search the current WoGE but the old ones could all be tested and looked at there. Maybe each WoGE then should have a link to the Blog it has originally been posted on. Anyways, just some thought I had spontaneously. I hope these aren’t made obsolete with your missing comment comment Ron. Ron, that’s a good point about having to track down through comments and is not my intention to dilute the experience and it would probably be better if I didn’t post links to the current and, say, previous 10 locations, unless I’ve made the ID. My initial aim was to join in and it certainly has inspired me to look around more and for further information about locations. Perhaps it’s just me, but I’ve been reluctant to join in before simply because I didn’t have a blog / website. I also thought it maybe useful to offer an alternative neutral place to host a WoGE for situations where the present incumbent was unable to host for a non-blogger for whatever reason. I’m completely happy to use A Thin Section just to post my suggestion for a WoGE and to publish any further suggestions if found by a non-blogger or at least text links to previous WoGEs but not the most recent 10 or so. OK, If’n I read the the comments above aright, I should send my suggestion for the next one to BrianR… so that’s what I’ma gonna do. I’ve been away from a computer since yesterday afternoon, just seeing all these comments now. Ron…sorry…not sure why your first comment went to my spam filter and the others didnt … maybe because of the links? I don’t know how that works. I think it’s good to have this discussion regarding the format for the A Thin Section website. I agree with Ron that some of the fun is knowing where it is at any one time. What we’ve done with the geo carnival site The Accretionary Wedge (see sidebar) is that we’ll archive the post there a couple weeks after it happened so the host for that month gets some traffic and visitors. But, it is nice to have that one site where they are all kept for future reference. Perhaps we could do a similar thing with A Thin Section? Like Mathias said, when the WoGE is solved and we’ve all moved on to the next one, it could be posted on A Thin Section with a link to the original. I’m not sure what the best solution is … we should keep discussing though. I definitely want to keep WoGE community-driven, so please add your two cents. I play, and I still have no intention of getting a blog. I think it should remain a movable feast – from blog to blog (with an updated .kmz archive (say via Ron)) and if someone who doesn’t have a blog wins, the original poster can have another go at choosing. I dont like the posts being moved, centralised and altered. Part of the charm of WOGE especially if you travel and miss posts, is tracking it down. sagan. I agree. I’ve misjudged this and I apologise. I think it would be more productive if I just stuck to posting my suggestions if I find a location. Ron’s .kmz archive is excellent and more than adequate. I’m still going to try and identify WoGEs though! No harm done I think JMA. It’s good to see we are actually discussing. It is a good sign that people are interested and care!